The internet has disrupted music, radio, print - and its next big target is traditional TV. And while it may not seem like a major shift as yet, it is coming. It's happening right before our eyes. This week, YouTube has officially launched YouTube TV, their pay-TV alternative which incorporates a range of channels and services, filtered through YouTube's app. As demonstrated in the video, for $35 per month YouTube TV will provide access to a wide range of channels, including ABC, CBS, FOX, NBC, ESPN, Fox Sports Networks, Comcast SportsNet and cable channels, including FX, USA, Disney Channel, Bravo, MSNBC, Fox News. You'll also be able to add Showtime or Fox Soccer Plus for an additional charge. You'll also be able to record an unlimited number of your favorite programs via YouTube's 'cloud DVR', which you can keep for up to nine months, and you'll have the convenience of being able to watch your content on any device - including the ability to stream to your home TV set via Google Chromecast (with support for more connected TV devices coming soon). So, cool, right, you can now watch TV via YouTube. But the offering itself doesn't necessarily provide anything new - as noted by Recode, it's essentially traditional TV in a new package. But that's really only the start of it - you see, once these online providers have you viewing content via their platforms, as opposed to somewhere else, that's where they can start to transform your TV habits, and build audience for their own content. This obviously enhances their own ad potential, but it also, importantly, enables them to establish themselves as genuine TV alternatives. On the advertising side, through the increased adoption of YouTube TV, YouTube will be able to monetize those new viewers with ads. This, essentially, will mean they can use online ad targeting for TV content, which is a significant advance on the current model - there may be some level of trade-off in the amount of ads they can show, comparatively (as they won't necessarily have traditional ad breaks), but the increased streaming of TV content through these newer providers is a potential game-changer for TV advertising, which, despite gradually declining consumption habits, is still a $72.01 billion industry in the US alone. But the other consideration is even more important - once viewers are watching TV through these platforms, that also enables them to showcase their own, original content. YouTube, for example, will have a whole new platform to showcase YouTube Red shows, which will likely see more people tuning in. Over time (and considering the consumption habits of younger users who already see YouTube as a traditional TV alternative), that could make YouTube content much more relevant. Maybe, in future, they won't even need outside content - people will become attuned to accepting YouTube as another broadcaster, supplanting traditional TV stations and providers. That's the wider shift, the logical endgame of all these bigger TV efforts. Twitter, which is among the leading platforms for 'second-screening' (where people are simultaneously active online while consuming TV content), is working to establish similar deals with pay-TV companies which would have them stream content through their app, similar to YouTube TV. "Under mooted deals with broadcasters such as Sky and BT, or equivalents in other countries like ESPN, customers who already have TV subscriptions would be able to link their subscriptions with their Twitter account, giving them access to paid-for channels within the Twitter app. It means that users could watch live Premier League games or TV premieres on Twitter, at the same time as reading and posting tweets about what they are watching." Facebook's working on similar arrangements, while Amazon just signed a deal with the NFL to stream live games this season. And what's Amazon's prime objective with their coverage? "The deal is roughly similar to the one Twitter had last year: CBS and NBC will each broadcast five games, and Amazon will stream the networks' coverage, including their ads. Amazon will have the rights to sell a handful of ad slots per game. Amazon says it may sell ads for those slots, but says it will also use them to promote the company's other video offerings." The aim here is not only to get more immediate ad dollars, but to become genuine TV providers in their own right, and with their own content. The challenge, thus far, has been that the majority of people like watching TV as they know it, and on the big screen, as opposed to their phones. More people are consuming more TV on more devices, but the big screen is still the main focus. These new deals pave the way for social networks and online providers to become TV as we know it. As noted, this is also why YouTube has put a bigger focus on kids entertainment - for younger users, YouTube already is a key alternative. If they can develop their own original programming, they can evolve their offerings to keep younger users coming back - and if they can then provide tools that enable you to easily watch your favorite YouTube content on your home TV, maybe you don't even need traditional TV channels anymore. On this, YouTube is also offering free Google Chromecast devices for YouTube TV users after their first month's payment (while supplies last). Along the same like, Facebook's evolving their TV app, and have been working on their own possible hardware device to connect your Facebook presence direct to your TV. Twitter has their TV app. It's not happening all at once - traditional TV remains a key platform for the majority of consumers. But when online content took over from newspapers, it went the same way - first there were some new options (largely dismissed by the traditional players), then they evolved with more professional content. Then consumption habits changed. If you're not watching TV through an online provider, you will be soon. And for marketers, the potential opportunities of that shift, both in targeted, affordable advertising, and increased reach, will be huge. 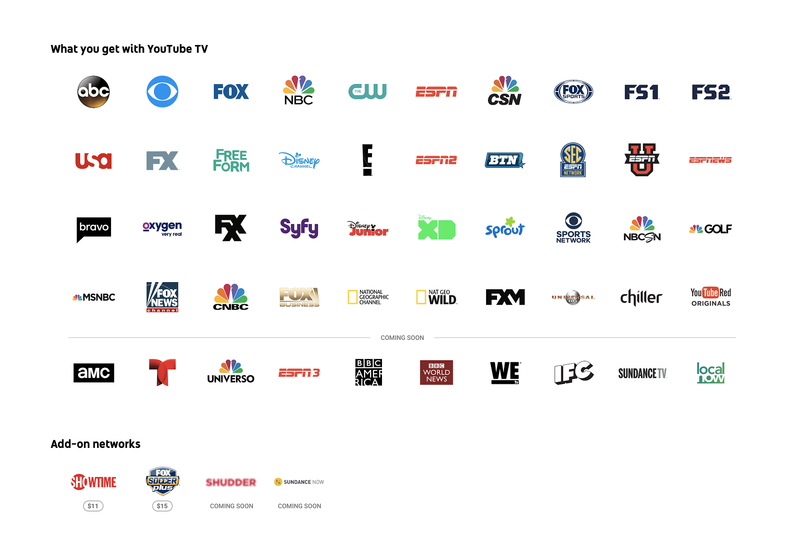 YouTube TV is now available in New York, Los Angeles, San Francisco Bay Area, Chicago, and Philadelphia, with more U.S. markets coming soon.